Posted by dr. gonzo in Architecture, Houses, National Register of Historic Places, Prairie style. Polo, Illinois is a small city of about 2,500 in Ogle County, a county whose largest settlement has less than 10,000 people. The rural communities in Ogle County are astounding and filled with history, art and architecture, if you know where to look. 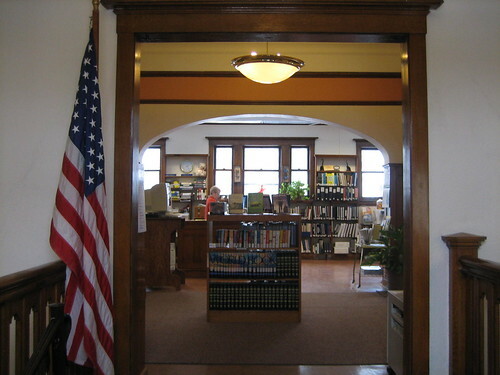 Armed with a list of sites in Polo from the National Register of Historic Places, I started looking at the Polo Public Library – a building that is one of five in Polo that share that status. 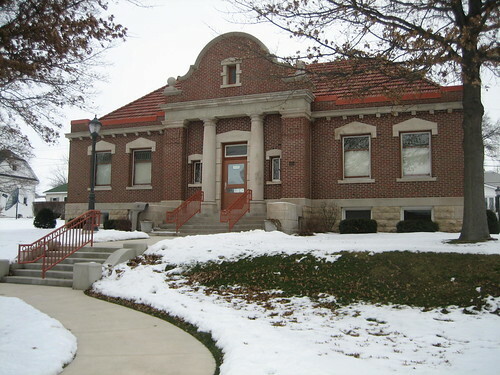 The Polo Library is a Carnegie Library that was constructed in 1903-04. It was added to the National Register of Historic Places in 1995. The librarians were friendly, giving me contact information for Polo citizens affiliated with historic preservation, and, most importantly, providing me with directions to an elusive lime kiln nearby (more on that tomorrow). The woman I spoke with chased me down in the cold of January several blocks from the library because she had given me the wrong email address by mistake. Very kind. Also in Polo is a cluster of architecturally important houses, all near each other, and all listed on the National Register, two of them the work of Joseph Lyman Silsbee (wiki) one of which reminds me of the important, earlier Frank Lloyd Wright-designed Winslow House. Silsbee was an influential and very important American architect. He served as an early mentor to Frank Lloyd Wright and was very influential on the young architect and other architects of the Prairie School. While the house is pretty obviously Classically influenced, some of the trademarks of Prairie style that Frank Lloyd Wright would later make famous are clearly visible, including leaded art glass and a low pitched roof. The building was constructed from 1899-1901 and added to the National Register of Historic Places (NRHP) in 1993. Behind the Bryant and Lucie Barber House is another Silsbee work, this one older. The 1891 Henry D. Barber House is more Classically obvious than its neighbor but still not what I would call a high-style example of Classical Revival. It’s an important work by an important architect, one that can be compared and contrasted with his other work, next door, from eight years later. The Henry Barber House was listed on the NRHP in 1974. Another Silsbee masterpiece, the 1891 Henry D. Barber House. The other house listed on the National Register in Polo is across Mason Street from the two Silsbee works. 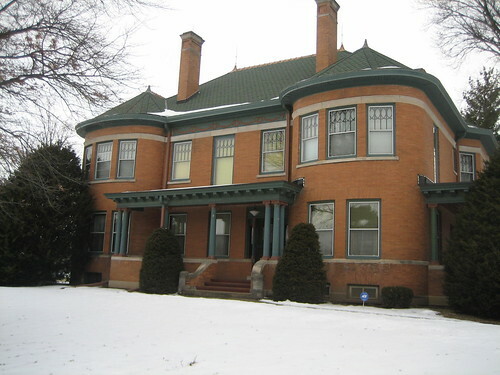 It’s an ornate Queen Anne style mansion known as the John McGrath House. 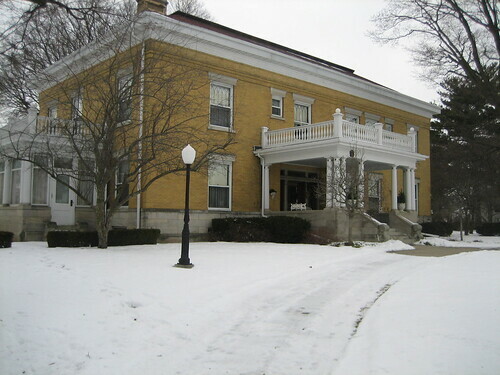 The Illinois Historic Preservation Agency (IHPA) hasn’t made the NRHP nomination forms available online (despite their assurance to me that they were available) for any of the listed buildings in Polo so I don’t know much about the McGrath House. I submitted a request to the National Park Service, and the IHPA but haven’t heard back from either of them. What I do know about the McGrath House is that it was designed by someone named George W. McBride. Unfortunately, the only George W. McBride I know of served as a United States Senator from Oregon. Though the senator was alive in 1896 when the house was built, he was not an architect and had no affiliation with Illinois anywhere I can find. I can only conclude that it is someone different. 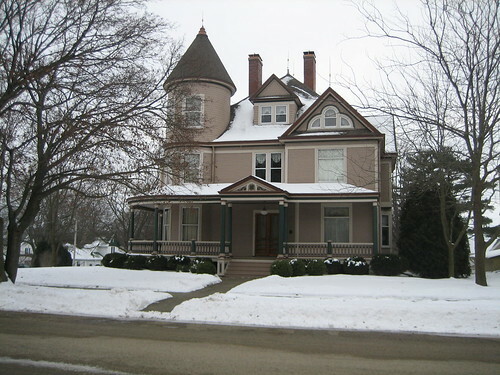 The McGrath House was listed on the NRHP in 1996. There are three non-residential sites in Polo listed on the National Register. We will take a look at a hidden one tomorrow.